Born in Stockholm, Katarina Karnéus studied at Trinity College of Music in London and at the National Opera Studio, sponsored by Welsh National Opera, and Glyndebourne Festival Opera. 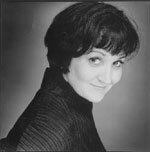 In 1994 she was the recipient of the Christine Nielsen Award and in 1995 won the Cardiff Singer of the World Competition. Internationally active as a concert and recital singer, engagements have included the Proms in London, the Salzburg and Edinburgh Festivals, a concert at Buckingham Palace with Franz Welser-Möst, concerts with Ozawa in Tanglewood, Berlioz’s La Mort de Cléopatre in the Amsterdam Concertgebouw, Schoenberg’s Gurrelieder in Düsseldorf and Elgar’s The Dream of Gerontius in Madrid and Barcelona. She appears regularly in recital at London’s Wigmore Hall, and recently gave recitals at La Monnaie in Brussels, in Washington, and made her New York recital debut at Lincoln Center. Operatic appearances have included Brussels and Netherlands Opera (Cherubino), Glyndebourne Festival (Dorabella), the Opéra National de Paris (Dorabella and Meg Page), the Opéra-Comique, Paris (Rosina in Il Barbiere di Siviglia) and the title role in Carmen), Welsh National Opera (Oktavian), Sesto (La Clemenza di Tito), Angelina (La Cenerentola), Rosina, Cherubino, and the title role of Gluck’s Orfeo), Olga (Eugene Onegin) at the Metropolitan Opera in New York and the title role in La Belle Hélène at the Châtelet in Paris. In 1999 she made her debuts at the Met in New York singing Varvara in Katya Kabanova and the Bayerische Staatsoper singing Annio in La Clemenza di Tito. She returned to Bayerische Staatsoper in 2000 for Sesto in the same opera, in 2001 for both Sesto and Dorabella, and in 2002 for Sesto in Giulio Cesare.